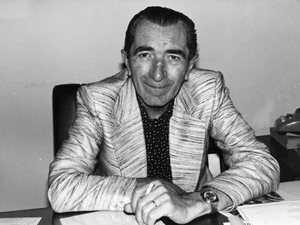 Fabio Taglioni (September 10, 1920 – July 18, 2001) was an Italian engineer. Born in Lugo di Romagna, he was chief designer and technical director of Ducati from 1954 until 1989. His desmodromic L-twin design is still used in all current Ducati motorcycle engines. Among the many race victories of his early desmo twin, the 1978 legendary return of Mike Hailwood at the Isle of Man is perhaps the most memorable. After WWII, Taglioni designed engines for Ceccato motorcycles and Mondial before joining Ducati in 1954. He began by designing Ducati's OHC four-stroke singles, and in 1963 designed the prototype V4 Ducati Apollo. This led to the 1972 Ducati 750 Imola Desmo, and the 1970s and 1980s production Ducati L-twin motorcycles. He died in Bologna in 2001. ↑ "Fabio Taglioni", Men who made history, Ducati Motor Holding S.p.A., 2009, http://www.ducati.com/heritage/protagonisti/protagonisti_taglioni.jhtml, "Wounded during the war, he returned home in 1949 and immediately started working with the Ceccato motorcycle company. In 1950 he was taken on by Mondial, where he worked until 1954." ↑ "THEORY AND HISTORY OF THE DUCATI DESMODROMIC ENGINE Forth Part QUESTIONS AND ANSWERS", The Ducati Desmodronic Engine, Ducati Motor Holding S.p.A., 2009, http://www.ducati.com/news/08/news011/news011_4.jhtml, "TAGLIONI I worked for two other companies before I joined Ducati. I designed a 75 twin camshaft, which was then adjusted for the Giro d’Italia (a twin camshaft was a bit too heavy). So it was turned into a single camshaft and was used in the Giro d’Italia on several occasions, in the Milan – Taranto and lots of other races, under the Ceccato brand. That engine acted as my business card when I was introduced to Count Borselli, on his request. He was looking for a young engineer, with a certain level of experience. I told him that I didn’t have much experience but I showed him the finished engine and said that was what I could do. He said to me: “I’m not interested in the engine but I’m interested in you because I work with 125s and up. I can help you to sell it if that’s what you want to do but I’m not interested in it”. And in fact he did help me sell it to Ceccato. He let me go to Ceccato for the tuning and then I worked at Mondial for two years, until 1954, when I joined Ducati. At Mondial I tuned engines for the Giro d’Italia, 125s and 175s, and then I started work on what was then known as the “Bilancerino”, the 125 with exposed springs and a head similar to the one on the Ceccato. Then I produced the twin camshaft, which was the same as the Ceccato twin camshaft, on a Mondial, and then because of staffing problems I left Mondial and went to Ducati, where I still am today." This page was last edited on 8 September 2010, at 11:22.